A REVIEW OF ERIC CLINE’S NEW BOOK 1177 BC . Half way through Eric Cline’s engaging book there is a map of the ancient eastern Mediterranean and Near East. 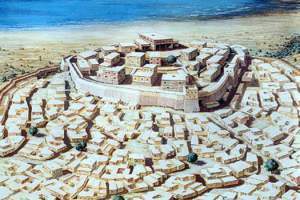 It shows 47 archaeological sites that were destroyed in the period around 1200 BC. They include the Palaces of Knossos,Mycenae, and Pylos in Crete and mainland Greece; Troy, Miletus, and Hattusas in Anatolia; Carchemis, and Ugarit in Syria; Megiddo (Armageddon), Lachish, and Ashkelon in the Lavant; and four less famous sites on the island of Cyprus, such as Enkomi. In Egypt shortly after this period, the New Kingdom pharaohs lost their authority over the country with the assassination of Rhamesses lll in about ll55 BC. The Bronze age collapse of Western civilization was complete. Explanation for the collapse have been offered for well over a century: some pre-date the actual excavation of most of the above sites during the 20th century. In general , beginning with the French Egyptologist Gaston Maspero in the 1860’s and 1870’s, and continuing until recently,the destruction has been attributed to an invasion by the so-called “Sea Peoples” . They are mentioned and depicted as captives) under the mysterious ethnic names Peleset, Tjekker, Shekelesh, Shardana, Danuna, and Weshesh in the hieroglyphic inscriptions of Ramesses lll at Medinet Habu. According to Ramesses, these groups overran the great powers of the day- the Hittites, the Mycenaeans, the Canaanites, the Cypriots, and others- until they were finally stopped in Egypt, first by the pharaoh Merneptah in 1207, and then again by Ramesses lll in ll77 BC. However there is no incontrovertible archaeological evidence for where the Sea Peoples came from, who they were, or what lands they conquered. The Shardana have been speculatively linked with Sardinia. the Peleset with the Philistines( who came from Crete, according to the Bible, and settled in Palestine); but there is no proof of these associations. The Sea Peoples remain as enigmatic as ever; notes Cline. Along with some other modern scholars, he argues: rather than militant invaders intent on destruction, they were more likely to have been refugees who did not necessarily always attack and conquer the local peoples but frequently simply settled down among them. Either way, they are unlikely, all by themselves, to have ended civilization in the Aegean and eastern Mediterranean . The capture of the Sea Peoples during the battle of Delta. If not outside invaders, what did destroy these cities? This, of course, is the subject of Cline’s book, which is the first title in a Princeton University Press series, Turning Points in Ancient History, The series aims not only to illuminate key events in the past, but also to elucidate their relevance to the present. The regional situation in ll77 BC and in AD 2013 are surprisingly similar, Cline remarks in his opening paragraph, ” The economy of Greece is in shambles. Internal rebellions have engulfed Libia, Syria and Egypt, with outsiders and foreign warriors fanning the flames. Turkey fears it will become involved, as does Israel . Jordan is crowded with refugees, Iran is bellicose and threatening, while Iraq is in turmoil. ; the fact that there is no 2lst century equivalent of the Sea Peoples (unless we compare them with the unfortunate African migrants attempting to cross the Mediterranean to Europe) might even provide further ammunition for those who doubt the Sea Peoples existence. Consider the astonishing Bronze Age ship wrecked off the south western coast of Turkey at Uluburun some time around l300 BC, which was discovered by a Turkish sponge diver in 1982 and subsequently excavated with great care by archaeologists led by George Bass. On board were products from at least seven different countries, states, and empires. 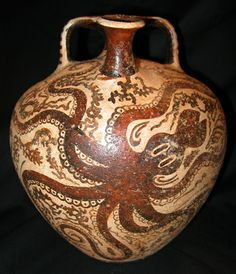 For example the cargo contained ten tons of copper from Cyprus and one ton of tin probably from Afghanistan, two dozen ebony logs from Nubia, almost 200 ingots of coloured raw glass from Mesopotamia, about 140 Canaanite storage jars containing terebinth resin, fruits and spices, brand new pottery from Cyprus and Canaan, scarabs from Egypt (one made of solid gold inscribed in hieroglyphics with the name of Nefertiti) and cylinder seals from the Near East (some made of lapis lazuli from Afghanistan), swords and daggers from Italy and Greece (which may have belonged to the crew or the passengers), and a stoner scepter- mace from the Balkans. Also found were 14 pieces of hippopotamus ivory and one elephant tusk. Although the owners and sponsors of the Uluburum ship are unknown, as are its port of origin and destination, it is reasonable to assume that the ship was part of a widespread international trade-not least because two other Bronze Age shipwrecks have also been identified. Consider also, an archive of clay tablets from Ugarit, on the Syrian coast, delivered during the construction of a military bunker in 1973. It contains correspondence between the king of Ugarit and the kings of Egypt, Cyprus ,Hatti, Assyria, Carchemish, Sidon, Beirut, and possibly Tyre. Curiously, apart from a single mention of enemy ships, the correspondence contains little evidence of trouble approaching, and suggests that sea-going trade with Ugarit continued right up to its destruction, which must have occurred some time after 1191 BC: the date of execution of an Egyptian chancellor corresponding with the king of Ugarit. Claude Schaeffer, the French archaeologist who originally excavated Ugarit in the 1930’s, argued that it was destroyed by an earthquake, Marguerite Yon, its most recent excavator, disagrees. She attributes the destruction to enemy attack, on the grounds that numerous arrowheads were found in the destroyed or abandoned ruins, along with buried hoards of valuables unclaimed by the inhabitants after their presumably hasty, forced evacuation ( an observation with sad resonance for today’s Syria. Other candidates for the cause of the collapse are: climate change, droughts, famine, internal rebellions, external invaders ( such as the Sea Peoples), and the breakdown of internal trade. The major evidence for each, drawn from many sites, is objectively considered by Cline- and dismissed as insufficient on its own. Finally he concludes: no single incident can really be imagined to have brought about the end of the Bronze Age; rather, the end must have come as the consequence of a complete series of events that reverberated throughout the interconnected kingdoms and empires of the Aegean and eastern Mediterranean and eventually led to a collapse of the entire system’, in other words, an invasion by the Sea Peoples will no longer wash as an explanation, but, as yet, we do not properly understand what happened in the period around 1177 BC. This is reasonable, if a shade disappointing. But then, aren’t historians ( Starting with Edward Gibbon in the 18th century) still debating what caused the fall of the Roman Empire in the 5th century AD – not to speak of the global financial collapse of AD2008 ? KORYVANTES: Who we are“KORYVANTES”, The Association of Historical Studies,is a Cultural Organization, researching and applying experimentally the Military Heritage of the Greeks from the Bronze Age to the late Byzantium. Jerolyn Morrison, my friend and colleague at the Institute for Aegean Prehistory Study Center for East Crete has been researching on Crete for 17 years into the domestic life of the ancient Minoans. Jerolyn and I worked at sorting and fitting together many bags of ancient pottery shards to form vessels for Jerolyn to make replicas of these vessels from local clay so that she could experiment with how people used them. At this stage I left her to continue with what has been her long term project, she works with archaeologists and botanists to discover what foods these ancient people ate; she uses the replica pots to cook feasts for local guests in the Minoan way, using the kinds of ingredients Minoans used. Of course all at the Study Center had a sneak preview first. 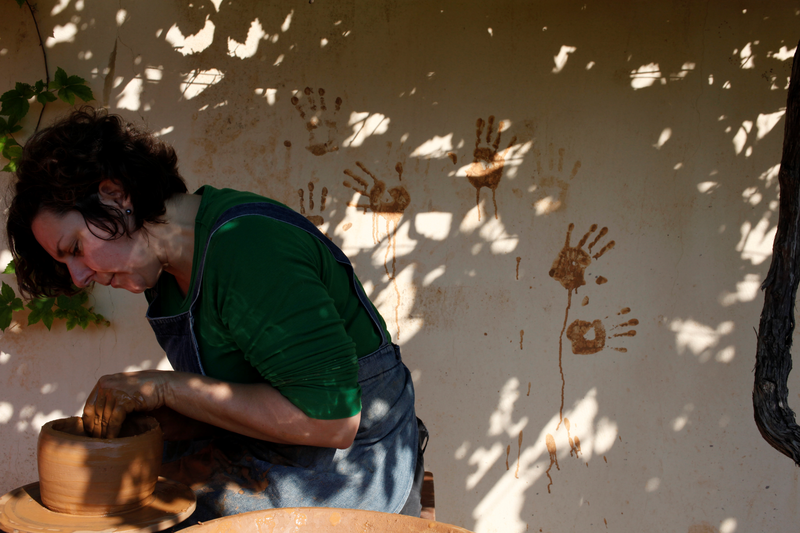 Jerolyn has a master’s degree in anthropology with emphasis in archaeology; she has been a Fulright Scholar and a trained potter and has just submitted her dissertation for a Ph.D. in Archaeology and Ancient History at the University of Leicester, England. 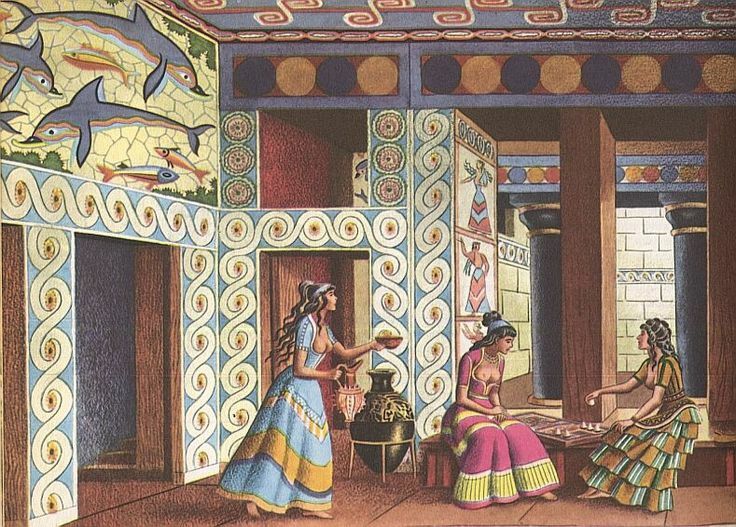 The Minoans, a Bronze Age people lived in Crete between 2000 – l500 B.C. They were a seafaring people ruled by a King; they built massive palaces and created vibrant frescoes; their city of Knossos was sung of by Homer, ‘ with their unique art and architecture, the Minoans made a significant contribution to the development of Western European civilization as it is known today, ‘notes Mark Cartwright in the Ancient History Encyclopedia, ‘ The archaeologist Sir Arthur Evans excavating at Knossos from l900 – l905 CE, discovered extensive ruins which confirmed the ancient accounts both literary and mythological, of a sophisticated Cretan culture and possible site of the legendary Labyrinth and palace of King Minos. 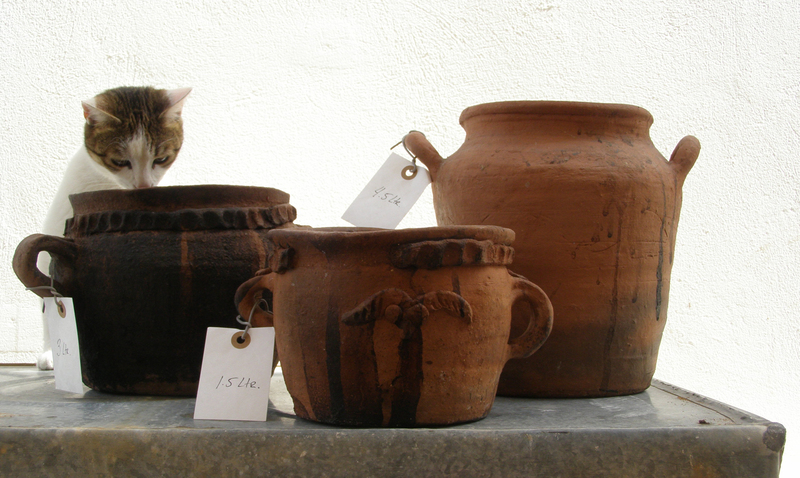 Jerolyn’s replica Minoan style cooking pots. That’s Cleo the Study Center’s cat inspecting them. 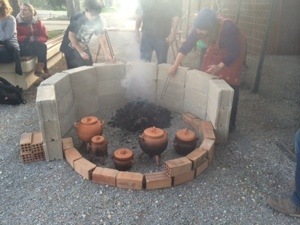 In 20ll Jerolyn’s team, Minoan Tastes (www.minoantastes.com), along with the excavators Chrysa Sofianou and Tom Brogan, produced a tasting for some 80 – l00 people in the village Papadiokampos in eastern Crete. Their menu and methods were based on the contents of House A1, an excavated two-story, multi- room, mud and- rubble house that had evidently been destroyed instantly, as evidenced by a smashed jar with the remains of fish soup near parts of the hearth. 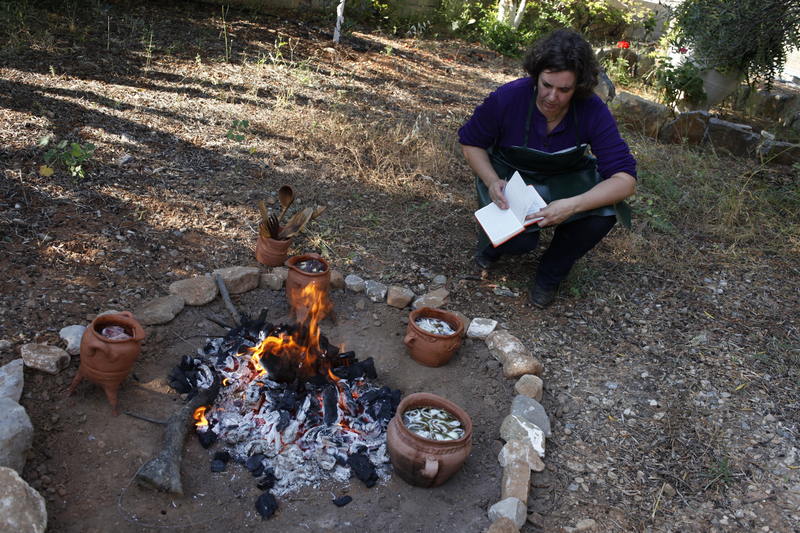 Her lecture at the British Museum and article in 2009 “Cooking Up New Perspectives for Late Minoan 1B Domestic Activities: An Experimental Approach to Understanding the Possibilities and the Probabilities of Using Ancient Cooking Pots” explains how they went about it. Lentils seasoned with honey, bay leaf, crushed coriander seed, sea salt and topped off with olive oil (this island had no tomatoes or carrots back then). Octopus simmered in either beer or red wine, and seasoned with thyme, garlic and leeks. Sautéed lamb seasoned with whole coriander seeds, garlic, and leek and finished off in a Cretan red-wine reduction. All of these dishes were cooked in pots on tripods. Also, some cooking dishes were turned over to allow the baking of flat bread. Jerolyns cooking demonstrations have been a huge success and she intends to carry on teaching and exploring ancient domestic cooking. Also to publish an online newsletter or journal as well as hold workshops and cooking classes. There is nothing like this in Crete or for Cretan studies, and this is important, because at the end of these study seasons you want to put together articles, lectures, and books to broaden the knowledge of these ancient civilizations and explain why modern people should care about them. Large chariot, horse burial found in China.